Kite surfing on the Tapajós River in Northern Brazil near Alter-do-Chão and Santerem, Brazil. Have you ever dreamed about a perfect place to learn kite surfing? Well, we have one for you! Flat water, strong wind, sandy bars to do tricks, breathtaking landscapes and experienced instructors… what else? Well, maybe a jungle adventure when the wind is not so good, beach parties, and whatever else the Amazon has to offer. 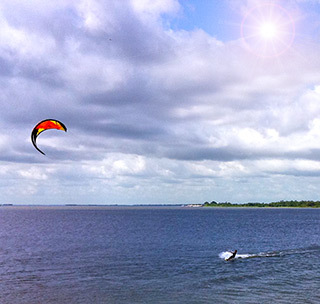 BIG TREE ADVENTURE TOURS is launching a 10-day fully packed trip for kiting beginners in a new destination on the kite surfing map – Santarem, Para, Brazil. We offer excitement and exploration in the heart of the Brazilian Amazon upon the waters of the Tapajós River! WHAT DO YOU NEED IN ORDER TO LEARN KITING? The perfect season for wind is from mid-August until the end of December. It is strong, but not so much that you have trouble blowing too far away. That is what this part of the Amazon is never lacking. Alter-do-Chão is not just one of Brazil’s TOP beaches, it is a perfect place for tricks – just take a look at the picture of Ponta de Cururu and you’ll agree. There are dozens of other beautiful yet unpopulated beaches and with hundreds of kilometers of white sand – Juá, Carapanari, Pajuçara, Pindobal… The scenery will be changing every day! Our kiting guide and instructor is Vitor Jennings – a local kite surfing teacher who has vast experience with hooking the Amazon wind. He is so confident in what he does during a 10-hour course, he says, “If you don’t learn within these 10 hours, I’ll teach you other 10 for free!”Any questions? BIG TREE ADVENTURE TOURS organized this 10-day program so that you will have a lot of FUN! We have a boat and a van available to board at any moment a strong wind picks up. 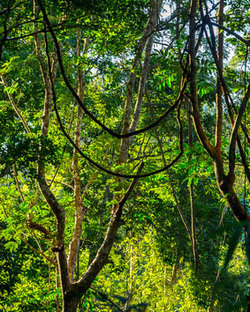 As soon as you arrive at ZERO IMPACT BRAZIL, which is our headquarters, you’ll have everything set up in a nice timber frame hut designed especially for hosting our guests at this very special gallery of Amazonian wood. Apart from enjoying a great ambience, traditional local food and other helpful things, you will be only 5 minutes from two great places created by nature seemingly for kite surfers – the beaches Juá and Maracanã. Every day our transport will take you to a new beach where your kite training will take place, and we’ll travel at least 150 km up the river exploring the best winds. And for more fun, we’ll take you to the 766 – a prime forest reserve of 766 hectares where you will experience a real jungle adventure. When the winds slow down enough to allow you to relax from intense kite training, you can have a blast fishing for piranhas, watching birds and alligators, and swimming in the finest freshwater in the world. If we are lucky, the end of the trip will result with a nice down winder in front of the city of Santarem – right where the blue stream of the Tapajos River clashes with the powerful brown water of the Amazon River. The whole incredible experience will culminate with a nice beach party, including a fire and an exchange of personal impressions. So, there’s the plan! BIG TREE ADVENTURE TOURS is waiting for you to join us on this historic inaugural journey that will open the gates to a great new destination for future kite surfers. Are you in?